I must apologize to you all that I haven’t spoken my mind in quite a while, but I’ve been busy taking care of my mares and keeping an eye on things here at the farm from my favorite vantage point. I can see the whole farm from that corner, and my girls just hang there with me. I must admit I’ve also kept my comments to myself because I’m concerned that sometimes I feel so strongly about things that I’m afraid it might have a backlash on Pam, which I certainly don’t want. I’m afraid this will be my last perspective, since I don’t think I’m going to finish this race, which makes me and everyone around me very sad. However, I can’t complain. I’ve had a great life here at GEVA with my mares by my side. I’ve taken good care of them, worried every time someone comes into our paddock to do something with them. I’m right there in their face, minding my manners of course, but I want to know what’s going on with them. I don’t know how many of you know my background, but I’ll fill you in a bit. I was really a good race horse, not great, but good. I won over $500,000, which was good money in my racing day. I was a stake winner and stakes placed. I don’t know if I gave it my all, since I ran second a lot and should have won, but I think I did or at least tried to win. I ran hard enough to fracture my cannon bone requiring pins in it. I also injured my suspensory ligament. They laid me up to rehabilitate, which I did. I came back to race and ran well, but then was off again. However, rather than let me retire in peace and just be a horse, as I deserved, I was brought back and raced in $5,000 claiming races. How humiliating! After all, I am still The Barking Shark, with a national following of fans. Of course I outclassed my company in those races and won. However, because I won I became like a ping pong ball being claimed each time I ran and bouncing from barn to barn. There were a couple of trainers who kept claiming me, John “Mickey” Martin and Lonnie Arterburn were two of them. There was a group who was concerned about my well-being because the trainers who had me weren’t. They were just interested in winning and making money. Ed Moger claimed me for Frank Lucarelli. The group that was interested in retiring me before I broke completely approached Ed Moger offering to purchase me. He wouldn’t sell and told the group to claim me. Well, that day it was rumored that there were going to be eight claims dropped for me. How popular can one guy get??! The group was upset about that and really wanted to get me away from the track to retire with GEVA. That sounded okay with me. So, what they did was offer the claiming price plus what would be the win purse if I won. Money always seems to talk, so they agreed to sell me to retire with GEVA. My arrival at the farm even made the Channel 5 news that night. I was very happy and have been ever since, just being able to be a horse with no demands made on me and never had a saddle on my broad back again nor a cold steel bit in my mouth. Now, this is what retirement should be. I was ten years old when they bought me, and I’d earned a comfortable retirement. I’m 23 now and have spent the past 13 years enjoying just being a horse, something I never got to do when I was racing. This brings me to what I have to say today. From what I hear, it sounds like there’s a big push for all of us “retired”, “injured” or “rehabilitating” off the track Thoroughbreds, as they now call us, to go on to second careers. Why? The donors appear to want it so we move out to make room for other horses to move in. Excuse me, why should I be expected to go on to another career instead of retiring, just to make room for another horse? Maybe if the donors gave more money to the organizations they could afford to take in more horses needing care, like me. 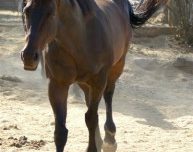 But no, instead of increasing funding to the nonprofits so that they might be able to manage a few more horses, they cut the funding back, from what I hear. When GEVA started over 20 years ago I’ve heard that there was little funding from donors, but I hear that the money was more consistent than it is today. I’ve heard Pam say that it’s hard to budget how many horses can come in here when we don’t know how much money GEVA will get in grants. Personal donations are unpredictable, but there are a few who have been consistent over the years and I know they’re most appreciated. Pam was almost in tears the other day, and she doesn’t cry except when one of us moves on to those greener pastures. I heard her say that she’d been cut in funding by about 50% this year and she didn’t know how she could take in any more horses now. She really wants and tries to help us. She nurses us back to health and soundness. She’s out here with us every day cleaning up our mess and giving us fresh feed and carrots. Oh how I love those carrots! I greet her at the gate every morning with a nicker and an expectation of carrots. After all, I am The Barking Shark and so deserve them! But she’s there rain or shine to care for me and my mares and the rest of The Gang, as we’re fondly called. I’m told that she doesn’t get paid for any of her loving attention to us. Anyway, it appears that the bottom line is money again. It’s not enough that we’ve gone out there putting on the show for the track owners, management, bettors and spectators, horse owners, trainers, jockeys, exercise riders, pony riders, gate crew, valets, test barn, grooms, hot walkers, vendors and any others who have an interest in racing. Instead of rewarding us with a nice retirement to live out our “golden years” we get dropped down in class until we get too hurt to run any more and if we’re lucky we get sent to a rescue or rehabilitation facility instead of going to slaughter or euthanized. But then once we’re healed up they want to adopt us out or sell us to someone to train us for a second career as a hunter/jumper, dressage horse, eventer, endurance horse, barrel racer, cutting horse, polo pony or some other discipline or some just as a trail horse. We’re again subjected to the human discipline and control, carrying a rider on our back, and usually a bit in our mouth, spurs in our side or a crop or whip in the hand. All we wanted to do, and deserved to do, was hang out in the paddock with our buddies and swat flies or play horse games, bucking and rearing and pawing and rolling and spinning and running full out because we want to, not because someone is whipping us to go faster. People separate us from our new found friends without a second thought about the bond we’ve formed with these other horses. We’re loaded in a trailer or van, shipped off never to see our friends again. Far too many of us are sent to auction to make a quick buck for the owner and then end up with the “kill buyers” who ship us off to a horrible fate of slaughter. It’s just plain wrong!! We deserve better!! I am The Barking Shark and I know what we deserve! Now they even have a “Retired Racehorse Project”. You figure. They refer to us as “retired racehorses”, but they have a “project” for us. That doesn’t sound like retirement to me. A “project” sounds like work for us, and that’s exactly what it is. 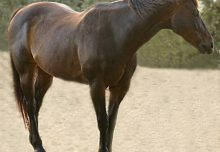 They’ve created a “Thoroughbred Makeover”, yup, a makeover. They want to make us into something other than a racehorse to show the world how versatile we are. We know how versatile we are. Just watch us out in pasture playing. We can do most of the dressage movements without a cue. We can turn on a dime and switch leads as many times as we want without anyone telling us how to do it. We can jump down banks and over obstacles without losing a stride and can judge our own take-off point. We can get down on our haunches and corner our buddy just as they want us to do with a cow, but we don’t need a rider to show us how to do it. There’s not much we can’t do without human intervention and someone off balance on our back and yanking on our mouth and doesn’t really know what they’re doing, nor do they really care what they’re doing to us. But to make the “makeover” even more tempting they’ve put up $100,000.00 in prize money for qualified contestants. That’s hard for a lot of people to pass up, so down we go into training again for a second career. People have a choice if they want a second career after retiring, but we horses have no say in the matter. Don’t get me wrong. 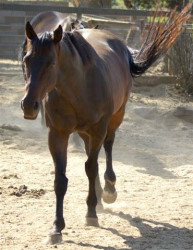 There are some horses who get bored in retirement and would rather go out and do something more. That’s fine, if that’s what they really want to do. I’m merely saying that I don’t think it should be what’s “expected” of usâ€¦ move us out so another can move in kind of like an assembly line. Hello, we’ve earned a rest! Let there be more funds given out there from the racing industry to provide for more of us “off the track Thoroughbreds”. I’ve been told that there are articles about me saying how much I loved to race. Yup, I did, but I’ve also enjoyed retirement and just being a horse. I could go on and on since I feel so strongly about this, but I’ll just say I feel very fortunate to have been retired here with GEVA for these past many years. I’ve had my mares, loving people, good feed and care and shelter. I’ve had the retirement I earned, thanks to a group of caring people who rescued me from certain injury if I’d kept on racing. So, dear friends, I really don’t want to leave this comfortable life I’ve had with my mares here at GEVA, but I think the greener pastures in the sky are beckoning me closer. I’ll miss you all and am very grateful I just got to retire and share my perspectives with you.